Brighten up a promotion with Neon Fluorescent Yardsticks printed with advertising. Applications include trade show, home & garden show giveaways, promotions. Features include natural wood construction painted in choice of neon colors. 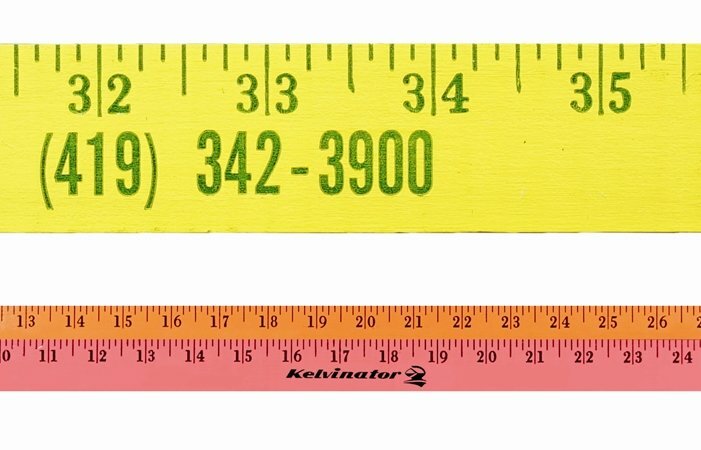 Yardstick Colors: Neon Yellow, Neon Orange, Neon Pink or assorted. Black imprint is recommended for highest contrast, inch scales in 1/8"
increments. The scales & your advertising printed in the same color. Hole drilled in the 36" end add $55 per 1000 units or increments. Overall size is 36 long x 1 1/8" high x 5/32" thick. Bulk packed. Delivery from date of an order of yardsticks is 2-3 weeks. This promotional yardstick is Made in the USA.